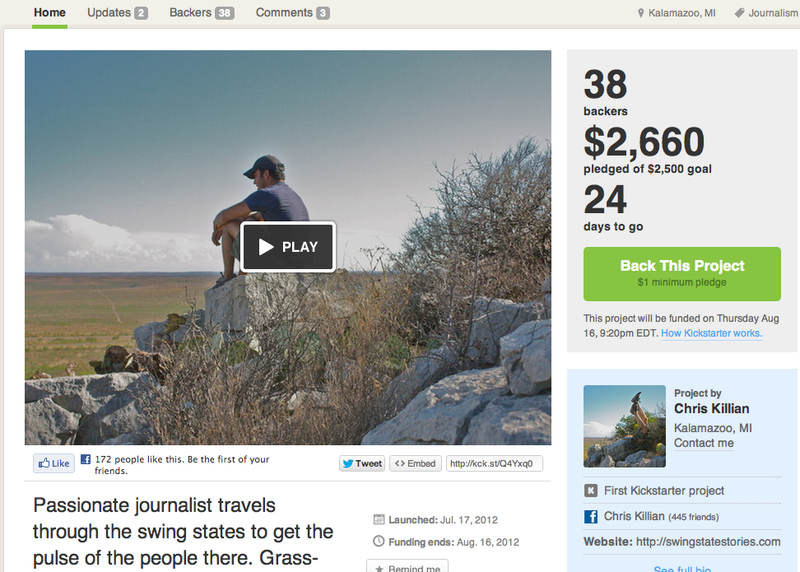 Could Kickstarter be used to crowdfund journalism? Under increasing financial pressure from the web and the decline of print advertising, newspapers and other traditional media outlets have been laying off staff and trying to fill the gap with services such as Journatic — the hyperlocal aggregator that uses offshore workers — or simply doing without things like copy editors. But are there other solutions to that reporting gap? Crowdsourcing journalism through sites like Reddit could be one, but crowdfunding could be another: One journalist in Michigan has raised funding through a Kickstarter campaign so he can travel around the U.S. interviewing people about the upcoming election. 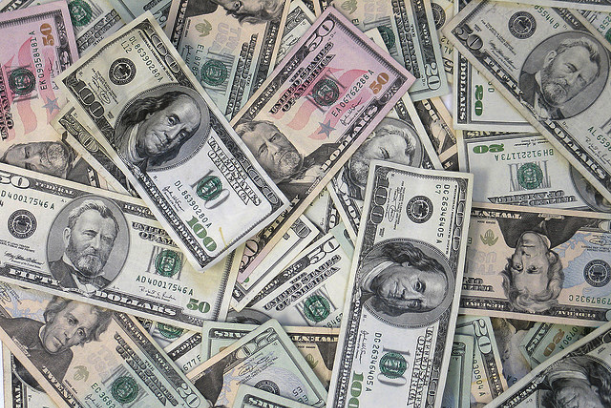 Could crowdfunding allow other journalists to do investigative or in-depth projects as well? Media blogger Jim Romenesko first called attention to the campaign by Chris Killian, a journalist from Kalamazoo who came up with the idea of driving through swing states like Iowa, Pennsylvania and New Hampshire in order to take what he calls the “pulse of the people.” On Sunday, just a few days after Romenesko’s report, Killian said he had reached his campaign goal, although it should be noted that it was not overly ambitious: He was only looking for $2,500 that he could use for living expenses, since he is planning to live and work out of his 1984 Volkswagen camper van ($2,000 of the total figure is for gas). Could journalists crowdfund major projects? Without meaning any offense to Killian, his project is definitely somewhat eccentric, and the amount he is asking for seems almost absurdly low. That’s especially when we are used to reading about a school-bus monitor who got more than $500,000 after being bullied by her charges or a young boy whose cardboard arcade at his father’s auto-parts store led to more than $200,000 being donated to his college fund. But could the core idea — raising money from potential readers for a specific project — work in principle for other journalistic pursuits? And would it work for mainstream media outlets, or just individuals? The idea of crowdfunding journalism isn’t a new one: Journalist and entrepreneur David Cohn started a company called Spot.us in 2008 to do exactly that and had some notable successes, such as a feature on the “garbage patch” in the Pacific Ocean, a joint project with the New York Times. Earlier this year the company was acquired by American Public Media and merged with the Public Insight Network, and the website says it has more than 15,000 contributors and 110 publishing partners (Cohn has since moved on to a new project, a media startup called Circa). It’s probably fair to say Spot.us isn’t really a household name, however — at least, not in the same way that Kickstarter has become the poster child for crowdfunding of both products and causes (although the bus-monitor fundraising came through competitor Indiegogo). In that sense, using Kickstarter might be more likely to win journalists some awareness and credibility if they started a campaign for a specific research project, the way Killian has. I have seen estimates from newspaper editors that the typical investigative project requires about $200,000 in funding for a paper to pursue. Could that amount be crowdfunded? Perhaps. That said, however, I’m not sure whether a platform like Kickstarter or Indiegogo or even Spot.us would work that well if a campaign were to be started by a major newspaper or the owner of a chain like Advance Publications, which has been laying off staff and shutting down printing at some of its newspapers. That kind of behavior isn’t likely to endear readers to the media outlet or make them want to donate money to it, whereas a unique or even eccentric project from an individual journalist like Killian seems to be more in the spirit of a Kickstarter campaign. Indie musician Amanda Palmer raised $1 million for a record and tour, but a record label would be unlikely to see the same kind of success. It would be interesting to see other journalists experiment with the kind of thing Killian is doing, however. There have been some projects that fit a similar mold, including one in which an independent cartoonist and war correspondent raised money for a reporting trip to Afghanistan in 2010. Maybe Morgan Jones, the 18-year-old who turned a Reddit thread into a journalistic outlet during the recent shootings in Colorado, could raise money to turn his account on the site into a permanent reporting gig. Update: I would be remiss if I didn’t mention one of the most prominent journalism-oriented Kickstarter campaigns — namely, a project called Matter, which is focused on publishing in-depth science journalism. According to co-founder Bobbie Johnson (Full disclosure: Bobbie is a GigaOM colleague who is based in England) the campaign is the best-financed journalism project ever on Kickstarter. Post and thumbnail images courtesy of Flickr user Tracy O.
American dream this, American dream that…damn sheeple. It’s always been a nightmare. I think that crowdfunding has opened its doors to anyone with a compelling cause to share with the rest of the world. What I love about this concept is that by the virtue of contribution, it somehow builds that sense of community, awareness – even when if it’s happening on a digital platform; even when you haven’t met in person those who would like to help you achieve your goals. Max Keiser and Stacy Herbert (TV journs) have been using crowdfunding for over a yr to raise $ for short doc film covering Euro finance problems. They would be the pioneers in this field. PFM was around before Kickstarter. I am pro finance journo with a well know byline for covering hedge funders and wall street bad actors who used http://www.piratemyfilm.com (created by RT TV host Max Keiser) in March to raise $ for an investigative story. I raised $4k in less than two weeks and went on two RT shows to talk about how well it worked. I found Piratemyfilm.com combined with the Keiser Report tv invterview was the best method to raise $ over Kickstater. Kickstarter also takes a % of the $ I raised where Piratemyfilm.com doesn’t. I tried Kickstarter a month latter because I needed a few hundred more to finish the video portion of the story and found their viewer wasn’t interested in finance jouranlism. I went back to PFM and got the extra $ in less than a day. Thanks a lot for mentioning that, Teri — and good points about Kickstarter. We’ve been investigating a similar system out here in Qatar. The popular press are pretty excellent at covering the world affairs, but are pretty beholden to the interests of the state. As a result, there is a pretty scant scene in the local journalism department, and in the minutes and hours following the recent fire at the Villagio mall (killing 19, including 13 children), the ‘new’ press – Twitter, and a Tumblr site called Dohanews.co provided by far the best coverage. Now, if only we can leverage this to improving the situation for the migrant workers here in Qatar who are currently working in 105-120 degree heat during the summers. I’m sure it would work for journalists who already have a name for themselves. In addition, the crowdfunding model or at least the compensation offer could probably be tweaked a little to attract more donations from organisations and not just individuals. Several local newspapers from different parts of the world could team up to crowdfund an investigation none of them could fund individually and get publishing rights for their part of the world. All kind of small organisations might be interested to fund investigations on causes they care about, if given the opportunity.